If you’ve implemented a chore system with your children you already understand the importance of children doing chores. If you are like me, then you might be hesitant to assign chores to your children until they can do things by themselves without making a bigger mess than they started with! I played around with the idea of chores for my children for years. I was never successful at implementing a lasting plan because I did not enforce it. Part of me understood well that children need chores. In fact, while working as a Marriage and Family Therapy intern, I would encourage parents to set up a chore system with their children for the benefit of the child and the parent. And, I’d leave the office and come home to a pile of dishes and laundry that I was certain only I had the skill to tackle. Does Perfectionism Keep You From Giving Your Children Chores? My problem with chores is the same problem that has cropped up in other areas of my life. Pesky perfectionism! I understood that children need chores in order to practice responsibility, but the thought of a dishwasher stacked askew or towels folded haphazardly made me cringe. The truth about children is that you have to patiently teach and reteach life skills. This applies to everything from how we treat others to developing good habits to chores. You can’t tell them once and expect them to do it perfectly from then on. If you think that parenting works that way or that children are being disobedient when they forget something you just told them two minutes ago, you’re sorely unprepared for parenting! When the boys were younger it was easier for me to simply do the chores myself instead of teaching them to do chores correctly. However, I’d always hear my advice to other parents in my head reminding me how important chores were for helping the boys to establish important life-long habits and life skills. Eventually, before the boys got too old, I worked out my issues in this area through life-coaching sessions. 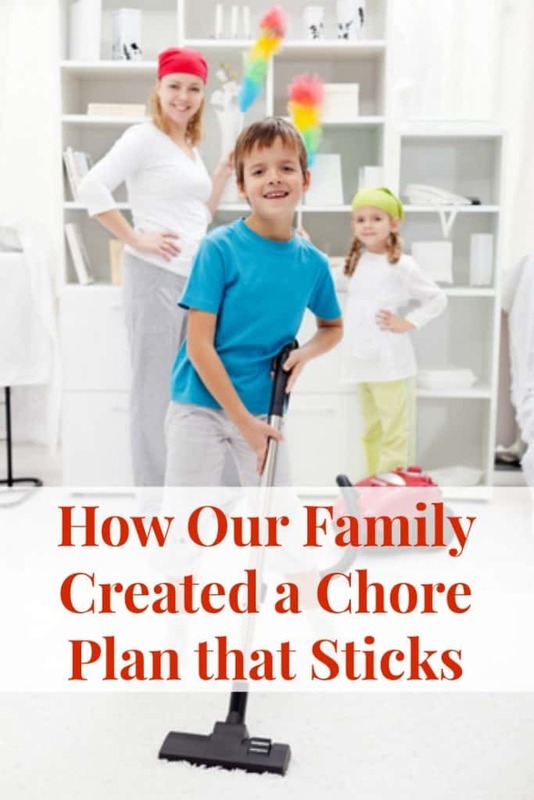 We’ve had a consistent plan for chores in our home for years now. I realized that I will never be able to fully focus on my work if my home is messy. I must have a neat and peaceful environment in which to work. Trying to get my home that way without any help, only to have to deal with the never-ending cycle of dishes, laundry and bathrooms was maddening. I could clean all day and still have cleaning to do when I was done! Implementing a chore plan for my children has been a sanity saver. I put the boys in charge of their own space. This includes doing their own laundry, washing their bedding once a week or as needed, cleaning their own rooms, and vacuuming their floors once a week or as needed. For me it was dishes, folding laundry, cleaning the children’s bathroom and cleaning the dining room that doubles as our school room. Depending on the number of children you have, you can throw in a couple of other chores to keep things even or fair. I included the small, but necessary jobs of tidying the living room and having one child each evening to be responsible for making sure the bathroom was tidy before going to bed. Should You Reward Children for Doing Chores? Choose a chore system. In the past, we have used My Job Chart and it’s a great system. If you choose to use rewards, My Job Chart helps you keep up with those. Even though My Job Chart isn’t what we are using right now it is an excellent and FREE system to use. I highly recommend it! I laminated them (I used this laminator ) and use a wet-erase marker so that we could reuse them and change chores around if necessary. It’s pretty simple. Divide up the chores as fairly as possible, but realize that children will find something unfair in anything, so be prepared to enforce what you have decided is best. If you see that something truly isn’t working or one child is unfairly burdened according to his or her age or ability, don’t be afraid to change things around. Also, if you struggle with perfectionism, you’ll have to learn that as long as things are getting done, they don’t have to be perfect. Continue to teach them the best the correct way to do things and they will learn. Relax and enjoy your free time once chores become a part of your children’s everyday life. Know that you are practicing good parenting, teaching your children responsibility and giving them a sense of accomplishment while building their confidence!